This engaging, exciting story with fantasy elements is guided by a strong Christian moral compass. Full of cryptic prophecy, shadowy characters, and a strong Christian theme, THE JEWEL OF HOPE is an exciting and fast-paced journey for young adult readers. Kathy Rae combines established conventions and creative twists to create a fun and inspiring story. Kaleb is a normal twelve-year-old boy. He plays with his friends, does well in school, and helps look after his younger brother, Max. Then, suddenly, strange things start to happen around him. Branches shake as he walks past, and cars shudder with no one inside. After playing with his brother in the park one evening, he returns home to find their house on fire. Later he sneaks into the damaged attic and discovers a mysterious pocket watch and a letter written to him by his mother, who died eight years earlier. In it, she warns him that he is in great danger, and that evil is threatening the Walla Valley and beyond. He learns that, as the seventh generation descendant of the great Chief Yunee of the Wavatee Nation, he is the chosen one in an ancient prophecy. As his thirteenth birthday approaches, he is invited to a celebration of his prominent lineage in Fountain Gorge, Arizona. Against his better judgment, he travels to the ceremony with his uncle Derek, who gives him the creeps. He soon learns that he was not summoned for a celebration at all, but as a sacrifice for an evil cult set on fulfilling the prophecy for their own benefit. Armed only with his trust in Jesus and a magical talisman, he sets off on a dangerous journey to right ancient wrongs and destroy the evil encroaching on the world. The story follows the standard prophecy format, complete with mysterious allies, powerful talismans, and a dualistic concept of good and evil. However, the use of real locations and a complicated interaction with Native American traditions gives it a fresh perspective. Using elements of fantasy conventions in the modern world lends a realism that only makes the supernatural and time travel elements more exciting. Cryptic messages, some from Kaleb’s mother and others from a trinket he finds on his journey, keep the narrative fresh and will be intriguing for young readers. The author provides just enough to keep readers interested without giving too much away, and her well-refined style makes the book easy to read and engaging. Using elements of a modern parable, Rae shows through the narrative how faith in the power of Christ is the only way to overcome adversity in the face of evil. This traditional thematic undertone, however, causes the story to be somewhat transparent. Characters who cause Kaleb’s intuition to tingle early on, like his uncle Derek and Derek’s cousin Zane, turn out to be, predictably, in line with evil forces. The winding plot makes up for this through a complicated time line and unexpected twists that will keep young readers inspired. 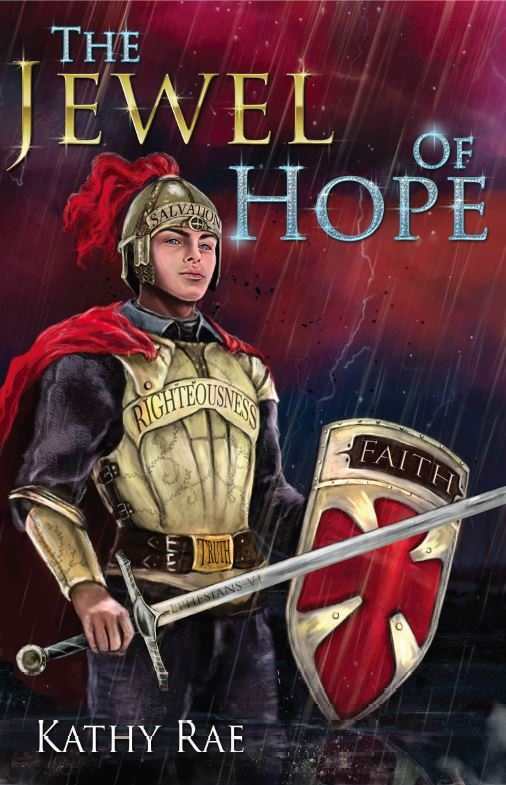 THE JEWEL OF HOPE will appeal to young readers looking for an exciting story and parents seeking novels with a strong Christian moral compass.